Leading European cloud hosting and Datacentre Service Provider, Netcetera celebrates 10 years at its modern state of the art datacentre, The Dataport. Netcetera has now firmly established itself as one of the UK's most innovative and environmentally friendly hosting providers around. Not only does the company continue to develop new products and solutions it has still been able to maintain it's position as one of the UK's most reliable, secure and trusted service providers. Over the last 10 years Netcetera has firmly established itself as one of Europe's leading Datacentre service providers from its home at The Dataport. Although the business has been operating for over 20 years, the last decade has seen the company lay a solid foundation for growth from its modern state of the art datacentre on the Isle Of Man. The Dataport has grown to become one of the most energy efficient datacentres in Europe. Investment in new technology has enabled the business to remain at the forefront of a competitive market, and consistently maintain growth. Foundations based upon its use of innovative technology, customer support and environmental commitment has made the company one of the most trusted and reliable Hosting providers in Europe. Netcraft, independent ISP monitors have now been auditing Netcetera's performance for over 10 years and we're pleased to say that during that 10 year period based at The Dataport, we have maintained an uptime record of 99.96 %. The Dataport has rapidly expanded over the last 10 years providing global clients with a wide portfolio of hosting, cloud and managed IT solutions. After an initial investment of £10 million the first hosting hall at The Dataport was officially opened in 2007, and it didn’t take long for Netcetera to attract global clients to the new facility. Netcetera is still the only Zero Carbon datacentre on the Isle Of Man and one of only a handful in the UK. Further expansion of The Dataport has taken place over the last few years and the company can now boast a second hosting hall that uses the most energy efficient environmentally friendly cooling system available. The new hosting hall, Zone 2, was opened in 2015 to meet the demands of a growing number of clients from across the globe providing enough rackspace for even the most demanding of clients. The Dataport now consists of 2 hosting halls, office facilities and a brand new modern onsite business recovery centre, providing a much needed breath of fresh air for many Isle Of Man based businesses requiring tailor made DR and Business Continuity solutions. Despite the datacentre services industry being highly competitive, Netcetera has carved out a niche in what is a global market. From its home at The Dataport, Netcetera has grown to have a large global customer base but still maintain a personal touch when dealing with clients. More recently the company has introduced what is quite possibly one of the world's largest global cloud hosting services, offering businesses the choice of hosting their cloud server in any one of 43 locations around the world. The introduction of this exciting new service will continue to enhance the position of Netcetera as one of Europe's leading specialist Cloud Hosting companies and the introduction of this new platform will dramatically improve the end user experience for many businesses who have a global client base. Although Netcetera offers global solutions, the business is very much firmly established in the Isle Of Man and to underpin this relationship with the Island, the company has also introduced an exciting new eGaming Cloud service which will further enhance the Island's reputation as one of the world's leading centres for the gaming industry. Netcetera would like to say a big thank you to all of our clients, some of whom have been with the company since the day we opened. Without this continued support and trust the company wouldn't be in the strong position it finds itself in today, and we now look forward to the next 10 years with the confidence that we will continue to build on our strong foundations and further enhance all of the services we currently provide maintaining our position as one of the most innovative Datacentre Solutions provider in the world. Netcetera is a leading European Cloud Hosting company located on the Isle of Man. We provide Datacentre solutions to a global client base in over 75 countries across the world. 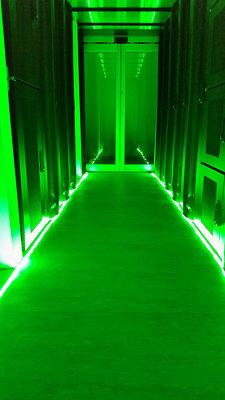 The business has been operating for almost 20 years and along with hosting, colocation, domain name registration, cloud and managed IT solutions the company also operates a modern onsite Business Recovery Centre allowing Netcetera to offer an all round backup solution for all businesses regardless of size. The Dataport owned and operated by Netcetera is a green datacentre. The datacentre is powered by hydro electric meaning that we are 100% Carbon Zero. Not only that but the company also has a very attractive PUE metric of 1.12, in simple terms this means we are also very efficient with how we use our green power supply which allows the company to pass our energy saving directly to the customer. Netcetera announces participation in the Microsoft Cloud Solution Program. This will enable Netcetera to continue focusing on offering the best possible choice of cloud hosting solutions including Microsoft's vast array of business solutions that include Office 365 and Windows Intune. Netcetera's continued expansion into bespoke business solutions gathers pace with the opening of planB. Netcetera's new Business Recovery Centre offers premium office space with customizable configurations and security options with shared and dedicated desk options available for use in a premises emergency.